Would you take a tea if no one was looking? Maryland-based company Honest Tea conducted a social experiment to test the honesty of America's cities. They set up honor system booths stocked with tea with a jar requesting $1. It was a marketing stunt and a social experiment all rolled into one: A company called Honest Tea on Tuesday tested the honesty of Chicagoans. On the plaza outside the Board of Trade at Water Tower Place and Millennium Park, stands of cold ice tea were set up with nothing more than a clear plastic box and a sign encouraging passers-by to pay on the honor system. Anybody who wants tea was asked to put a buck in the box. "It’s an experiment we’re doing all over the country," said Evan Nimke of Honest Beverages. Poll: How Honest is Chicago? In Chicago, the lunchtime crowds are taking to the idea. Most people pay for what they take and expect others to do likewise. "They’ll put a buck in there," said trader Mario DiBartolo. "They are honest people." 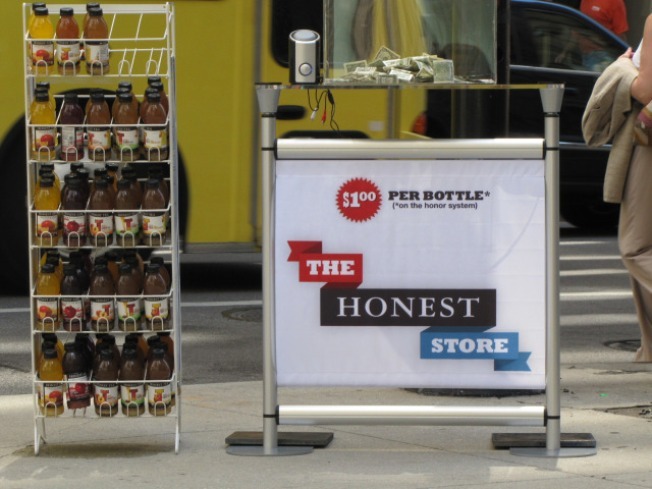 Honest Beverages has set up similar stands in cities like Boston and New York with varying results. On Wall Street, only 89 percent of people paid up, but in Beantown the number was more than 93 percent. How is Chicago doing? With two days under his belt, Nimke said the numbers are promising. "Chicago seems to be a pretty honest city," he said. "Somebody has to be honest in Chicago," she said. "It’s the people, not the politicians." The results of the experiment will be posted to Honest Tea's YouTube channel.